We’re celebrating Børge Mogensen’s most celebrated piece. The story of The Spanish Chair goes back to 1950, when the Copenhagen Cabinetmakers’ Guild’s exhibition presented furniture under the theme of ‘A Hunting Lodge’. One of the pieces shown was designed by Børge Mogensen, who – for the first time – had used solid wood for the frame of a chair and saddle leather for the seat and back. These raw materials were used in the same way eight years later, when Mogensen created The Spanish Chair, whose name acknowledged its inspiration, which its designer had discovered on his travels and would call upon several times thereafter: Spanish medieval furniture. The story of Mogensen is inextricably linked with that of Fredericia Furniture. In 1952, two years after he opened his own design office, Mogensen began to collaborate with Andreas Graversen, an interior architect and entrepreneur. Graversen acquired Fredericia in 1955, and he and Mogensen became friends as well as business associates, driven by a shared desire to create aesthetically pleasing, simple, high-quality furniture. The 1958 edition of the of the Copenhagen Cabinet-makers Guild’s Exhibition saw Mogensen return not only with The Spanish Chair but also with confirmation that his new product would be manufactured by Fredericia – which has been the case ever since. Beyond its unique aesthetics, the chair boasts practical features such as the broad armrests that support items like glasses. The benefits of these were demonstrated at the exhibition, where the area in which The Spanish Chair featured had all tables removed from the floor to create an open, more relaxed and more convivial living space. 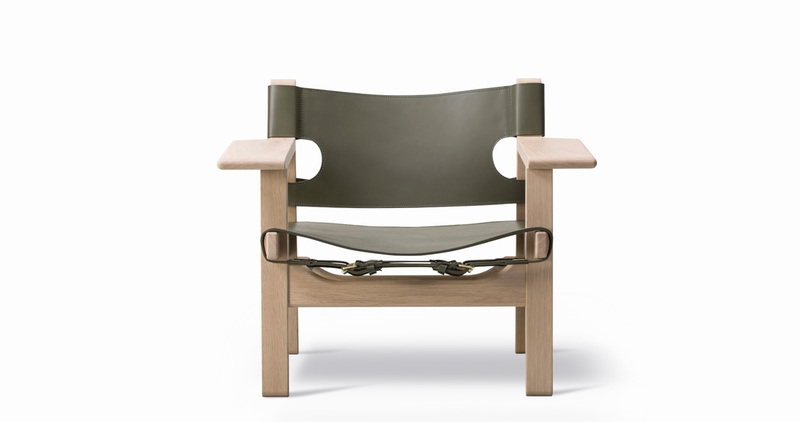 To celebrate 60 years of this innovative icon, Fredericia has launched a special edition, available only until the end of the year, in solid oak combined with elegant Olive Green saddle leather – celebrating not only the distinctive, geometric form of The Spanish Chair but also the high-quality materials used to construct it.